Allhouse, M. (2015). Room 101: A movement towards social learning spaces? A survey of SAC managers in UK higher education. Studies in Self-Access Learning Journal, 6(1), 124-137. As more and more self-access facilities face up to the challenge of shrinking budgets and responding to the ubiquity of mobile devices for learning, Michael Allhouse’s column examining the movement towards social learning that has taken place at the University of Bradford reminds us that such centres have a valuable role beyond providing access to physical resources. In this final instalment of his three-part series, Allhouse examines the provision of self-access in UK Higher Education, in order to determine to what extent Room 101’s journey towards becoming a social learning space is reflected in other centres around the country. By widening the scope of his research to examine not only the attitudes of learners at his own centre, but also wider trends across the UK, he reveals a diverse picture of self-access, and one in which social learning plays a vital and growing role. Room 101 is the self-access centre (SAC) at the University of Bradford (UoB). Room 101 was originally a place to access learning materials in physical form but over the last ten years it has adapted its approach, moving away from materials-based resources (such as books, software, CDs, and photocopied resources and exercises) towards becoming a social learning space: a space where students learn from each other in person, through interaction-based activities (such as discussion clubs, tandem learning, student-led language groups, and informal social interaction). The previous instalments of this column have outlined Room 101’s movement towards social learning, and examined students’ reactions to the new social learning focus, which have been very positive. This final instalment will attempt to discover to what extent Room 101’s journey is typical of other UK Higher Education (HE) SACs through a survey of UK HE SAC managers, examining whether social learning methods are employed in other SACs to the same degree as in Room 101. Where this is not the case, the instalment will look at what other SAC models exist in UK HE and how the services the SACs offer affect their popularity with students. What different SAC models are there in UK HE and how does the provision of different types of services affect the usage of these models? To what extent is Room 101’s social learning approach used in other UK HE SACs? In order to find out the answers to these questions a short online survey was devised. The survey focused on the different services available in SACs and attempted to get some measure of how these different services affect usage. The research was conducted through a questionnaire created using the webpage SurveyMonkey. The survey link was distributed electronically via email lists of HE SAC staff with the request that SAC managers fill it out. Due to time constraints there was no pilot. The survey yielded 33 responses over a two week period. All responses were anonymous, under the assumption that this would allow respondents to speak more candidly. The survey consisted of a combination of both quantitative and qualitative questions intended to answer the research questions. Questions asked how many users used each centre per day, the kind of activities and services that were available, whether demand for some services was decreasing, and about the link between SAC provision and the curriculum. The first question was open-ended, and asked; ‘Roughly how many students use your SAC each day?’ Responses varied considerably; from 4 up to 250, but with most answers being quite low. Some respondents did not answer this question. Table 1 shows the respondents’ responses, grouped into different ranges. Many of the centres were catering to less than 20 users. 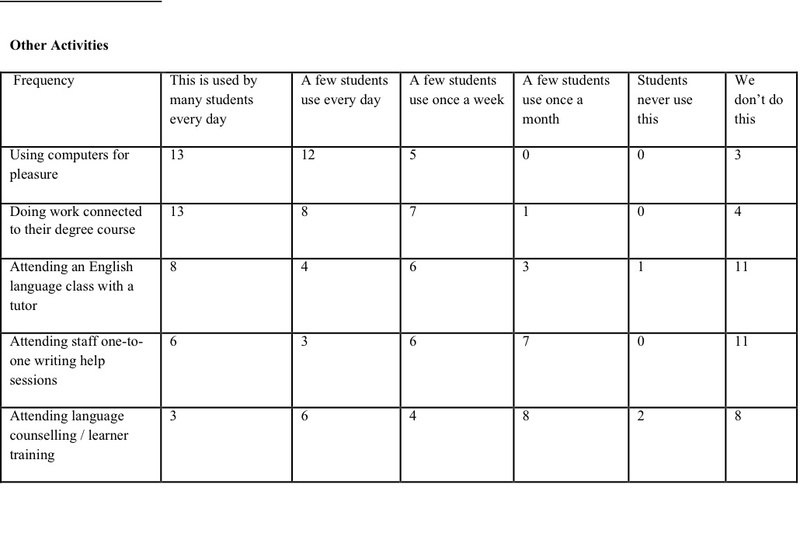 Room 101 at the time of the survey was attracting well over 200 students per day (Allhouse, 2014), a healthy figure in comparison to many of the responses. There were only two other SACs in our survey that reported over 200 users. the number of international students at the institution. Of the services provided by your SAC, how often do you think students use each one? This question used a list of possible SAC services. 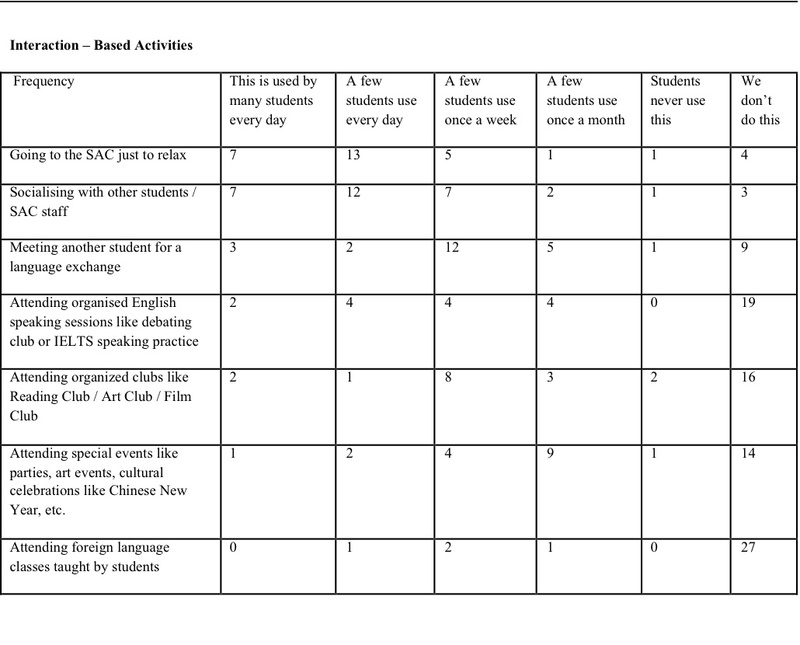 To devise a comprehensive list of SAC services the author included activities from Room 101 as well as from an examination of literature detailing SAC activities. The list was populated using examples from the works of Little (1989), Gardner (2000), McMurry, Tanner, & Anderson (2010), Morrison (2005), and Del Rocío Domínguez Gaona (2007), which could be seen as primarily materials-based SAC activities. The list also included activities detailed in the research of Croker and Ashurova (2012) and Murray (2014) which could be seen as interaction-based. Respondees could answer the question by selecting from possible responses such as ‘something they don’t provide’, or on a rating scale from ‘something students never use’, to ‘something used every day by many students’. Table 2. Results of the question ‘Of the following services provided by Room 101, please state how much you use each one’. It seems that some of the SACs have relatively high rates of students using materials-based resources for language learning (books, CDs, newspapers). From looking at the full individual responses it appeared that the SACs with high materials-based resource usage were where the SAC is part of a foreign language department, although there was not always sufficient information given to draw such conclusions for every respondent. When examining what seems to be most attractive to students the most popular activities are using computers for pleasure, using the internet to learn English, using the SAC for other university work / homework, attending a class, and using the centre for relaxing and socializing. Relaxing and socializing was mentioned many times in the survey and several respondents mentioned that they employed student assistants or had student volunteers running the centre, trying to make the centre more student-friendly. Some consideration needs to be taken of the different nature of activities, i.e. materials-based resources such as books can be used by many people all day, as opposed to English clubs which cannot happen with such frequency because of organizational issues, in most cases only happening once or twice a week. Bearing this in mind social learning activities, like English clubs and other social clubs, can be said to be comparatively popular. Many of the SACs in the survey did not offer social learning activities like student-led language classes, discussion clubs, or cultural parties, and yet students were using the centre to socialize with each other in unstructured settings. What else do students do in your SAC? In Room 101 we have striven to keep tandem learning based in the centre by providing materials, facilities, and an attractive setting. Is your SAC provision linked to classroom teaching? 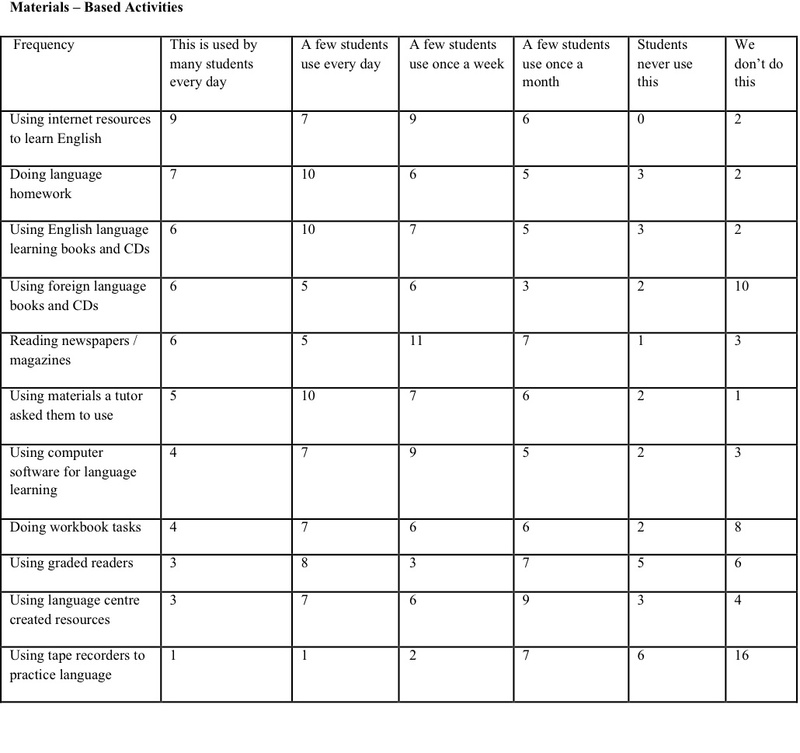 Many respondents explained that their SAC operates independently of classroom teaching, with one respondent even commenting that teachers “ignore the SAC most of the time”. Indeed, this kind of answer was quite common, with 15 respondents giving some variation on this theme as a response. Generally there was the sense that teachers tell the students to use the SAC and occasionally they use SAC computers for a class. Are there any services you provide which you would say are becoming less well used? The answers to this question were often similar and could be grouped into a number of themes, as shown in Table 3 below. Some of the answers given overlapped, with some respondents saying, for example, that they were likely to be integrated into the library because of the availability of material on the web. This answer would be acknowledged in the themes ‘Impact of new technologies’ and ‘Services being scaled back’. In response to this question almost two thirds of the respondents gave an account of materials-based resource use in decline; CDs, English language learning software, books, and audio-visual language resources, were all acknowledged as being used less. Respondents asserted that this is due to the availability of resources on the Internet and the affordability of electronic devices. Another major theme that emerged from this question was the scaling back of SAC services. Several of the managers acknowledged that their SAC is likely to be closed or integrated into the library. The main reasons given were that students want to study at home, and that tutors are making follow on material available outside of class on the internal Virtual Learning Environments (VLEs). One of the limitations of this research was that there was no direct question about the nature of the institution and the courses on offer, so it was not possible to know the relative sizes of the institutions, the extent of taught language provision, or the number of international students. Because the survey was anonymous it was not possible to trace this information retrospectively. Navarro (2014), when looking at different SACs, found that “there exists an array of mission statements, principles, descriptions of services, and outlines of goals and objectives. I was left with a highly eclectic picture of SACs.” (p. 9). The research in this column has supported this finding and has attempted to examine the range of these different services and objectives. “General drop in usage, possibly as students have their own laptops/phones to find online learning materials on their own”. The most frequently used SAC in our survey reported around 300 daily users, and was in a university with large numbers of foreign language undergraduates and full-time English learners. This SAC reported healthy usage of materials-based resources, but more popular were tandem learning, film viewing, and group work, and their most popular activities were socializing/relaxing and using computers to do coursework and for pleasure. “There is the ‘false’ perception among some that ‘you can do it all online’”. This phenomenon has also been observed by researchers such as Reinders (2012), who has suggested that so many new ways of connecting with resources and learners online have emerged that the need for a physical space for materials-based self-access has to be questioned. Navarro (2014) in his study of SAC managers found that “one of the most significant challenges faced by SAC educators is finding (or creating) material that motivates learners to take more control over the actual learning process” (p. 22). This has been the experience of Room 101 which found that even physical authentic texts developed with Language Centre staff did not appeal to users, getting very little usage. The survey also found that SACs and Language Centre staff are not always working together as much as they could. There is perhaps a need for further research on language tutors’ attitudes to SACs and material provision. SACs with a social learning / interaction-based focus. This is very similar to what was happening in Room 101 around ten years ago, which was what led Room 101 to become a social learning space. SACs with a social learning / interaction-based focus. SACs in this environment which had embraced social learning were often thriving, mostly through the inclusion of facilitated interaction-based activities and a more informal approach. Table 4. Excerpt from Research by Navarro into SAC Manager Beliefs. Navarro’s finding that the SAC managers confirmed the importance of providing access to ‘target culture contact’ and ‘successful language users’ is particularly interesting in relation to this study; these are things which Room 101 and other social learning SACs do through interaction-based activities. Whilst one respondent to our survey said that “I think the fixed place for self-access is less popular as students want to work during their own time and in the environment of their own accommodation”, this research has shown that where SACs are using social learning / interaction-based activities they are thriving and relevant. The last section has shown that social learning methods are clearly used in some SACs. 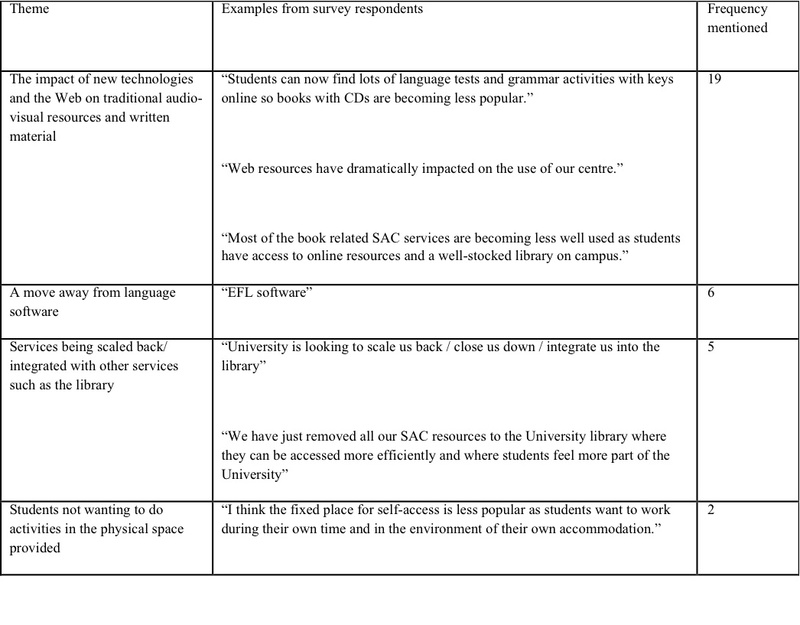 Indeed some of the SACs in the survey seemed remarkably similar to Room 101, reporting that students use the centre for socializing/relaxing and for student-led clubs, such as speaking practice sessions run by volunteers or staff. One such centre seemed to be thriving and when asked what was declining, said “Nothing – tandem learning and speaking practice are as popular as ever”. Semi-structured social learning. Many SACs in the survey did not offer social learning activities (like student-led language classes, discussion clubs, or cultural parties), and yet students were still using the centres to socialize with each other. This is interesting as in Room 101 and in the work of Croker and Ashurova (2012) and Murray and Fujishima (2013) the semi-structured social learning activities were some of the most popular activities. It can be suggested that some sort of facilitated social learning involving speaking and listening practice might be a good addition for some SACs. This is a finding supported by Croker and Ashurova (2012), Murray and Fujishima (2013) and many of the respondents in the research. 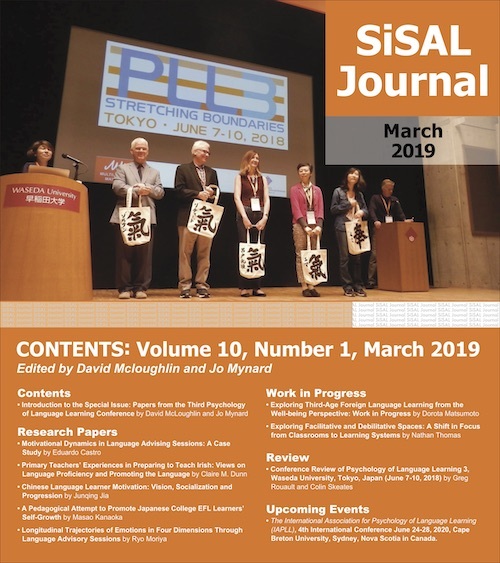 Murray and Fujishima (2013) ran a social learning space for language at an institution in Japan and had success with non-formal settings and semi-structured social learning activities. Also in Japan, Doyle and Parrish (2012) found that students mostly wanted opportunities to practice speaking in-person, and Navarro (2014) also emphasized the importance of this. This reflects Room 101’s experience which found that students mostly want opportunities to speak in English in informal and semi-structured settings. Student Assistants. Several respondents in our survey mentioned that they employed student assistants or had student volunteers running the centre, trying to make the centre student-led and student-friendly. Room 101 has been hiring student assistants, and encouraging student volunteers for several years, and at the point of writing we have around 30 student workers helping to ensure the centre is student-focused. Heigham (2011) found that the use of student workers increased attendance at her SAC, which was also promoted as a place where students could talk to and learn from their peers. Murray and Fujishima (2013), giving advice on how to start a social learning SAC, emphasized how by employing student assistants and creating semi-structured opportunities to practice language, a community can form around a centre. Room 101’s student helpers, and social learning initiatives like discussion club, have created exactly this environment. These other studies and examples from the survey echo Room 101’s own findings as it moved towards becoming a social learning space. This demonstrates that, with concerns around the declining popularity of materials-based resources, one possible element of provision which could help SACs remain relevant in future is more interaction-based activities. This instalment has looked at whether Room 101 is typical of UK HE SACs. It seems that there are some, even many, SACs which have a similar provision and perhaps a similar story to tell, one of a movement towards becoming social learning spaces. The research identified two main environments which SACs operate in; one where high numbers of students are taking foreign languages and English courses recruit many students, and one where English only is taught. SACs operating in the first of these environments were often well used and usage of materials-based resources was healthy. There was however a detectable movement away from materials-based resources and towards social learning in many of the survey respondents’ accounts. Croker and Ashurova (2012), Murray and Fujishima (2013), Heigham (2011) and Room 101 all seem to be suggesting that social learning could be such a function. All of these writers and those SACs in our survey which were using social learning / interaction-based activities reported healthy learner usage. Whilst different SAC models exist, with differing levels of usage, successful models show a movement towards social learning. This research and examples like those given above can all provide examples of interaction-based activities which would benefit any SAC. Michael Allhouse has worked in Room 101 for almost 18 years, longer than Winston Smith, Paul Merton, Frank Skinner and O’Brien put together. He was awarded International Student Advisor of the Year 2014 by UKCISA / NUS. He works for the Student’s Union at the University of Bradford where he is running and designing other social learning spaces for specific groups of students. Little, D. (1989). Self-access systems for language learning. London, UK: Centre for Information on Language Teaching & Research.